Leading Manufacturer of folding multipurpose ladder- 470 cm, folding multipurpose ladder- 570 cm, folding multipurpose ladder- 670 cm, folding multipurpose ladder - 260 cm and folding multipurpose ladder - 360 cm from Surat. Material used : Aluminium Alloy. Size - 470 Cm. (When fully opened), Self supported "A" Shape-220 Cm. Ht., Platform-200 Cm Long, 118 Cm Ht.,Fully Folded-120 Cm. Product Weight - 18 Kg. Strong and stable design capable to carry load up to 150 Kgs. DIMENSIONS : Platform in "C" Shape - 200 cm Long, 118 Cm Ht., Fully Folded - 120 Cm Ht., "A" Shape- 220 Cm Ht., Wt.- 18.00 Kg. Folding multipurpose ladder is the best utility product combined with ease of handling and comfort in carrying away for outdoor/ field use. Made out of strong aluminium alloy material which enables to take weight up to 150 kg. With the great stability in upright position. This product can best be used for indoor as well as outdoor filed applications. It can be operated straight with wall support as well as can stand independently converting the ladder into a conical shape by operating joints. Also can be used as a horizontal work platform having 200 Cm long span with 118 Cm height. Also can be used as self supported ladder with 220 Cm Ht. Gross Weight 18 kg. Material used : Aluminium Alloy. Size - 570 Cm. (When fully opened), Self supported "A" Shape-277 Cm. Ht., Platform-257 Cm Long, 147 Cm Ht.,Fully Folded- 152 Cm. Product Weight- 22.5 Kg. Strong and stable design capable to carry load up to 150 Kgs. DIMENSIONS : Platform in "C" Shape - 257 cm Long, 147 Cm Ht., Fully Folded - 150 Cm Ht., "A" Shape- 277 Cm Ht., Wt.- 22.5 Kg. Folding multipurpose ladder is the best utility product combined with ease of handling and comfort in carrying away for outdoor/ field use. Made out of strong aluminium alloy material which enables to take weight up to 150 kg. With the great stability in upright position. This product can best be used for indoor as well as outdoor filed applications. It can be operated straight with wall support as well as can stand independently converting the ladder into a conical shape by operating joints. Also can be used as a horizontal work platform having 200 Cm long span with 118 Cm height. 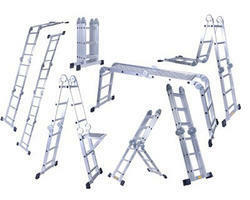 Also can be used as self supported ladder with 220 Cm Ht. Gross Weight 22.5 kg. Material used : Aluminium Alloy. Size - 670 Cm. (When fully opened), Self supported "A" Shape-277 Cm. Ht., Platform-257 Cm Long, 147 Cm Ht.,Fully Folded- 152 Cm. Product Weight - 20 Kg. Folding multipurpose ladder is the best utility product combined with ease of handling and comfort in carrying away for outdoor/ field use. Made out of strong aluminium alloy material which enables to take weight up to 150 kg. With the great stability in upright position. This product can best be used for indoor as well as outdoor filed applications. It can be operated straight with wall support as well as can stand independently converting the ladder into a conical shape by operating joints. Also can be used as a horizontal work platform having 257 Cm long span with 147 Cm height. Also can be used as a self support ladder with total height of 277 Cm. Material used : Aluminium Alloy. Size - 260 Cm. (When fully opened), Self supported "A" Shape-115 Cm. Ht., Platform-88 Cm Long, 66 Cm Ht.,Fully Folded- 64 Cm. Product Weight - 15 Kg. Strong and stable design capable to carry load up to 150 Kgs. Folding multipurpose ladder is the best utility product combined with ease of handling and comfort in carrying away for outdoor/ field use. Made out of strong aluminium alloy material which enables to take weight up to 150 kg. With the great stability in upright position. This product can best be used for indoor as well as outdoor filed applications. It can be operated straight with wall support as well as can stand independently converting the ladder into a conical shape by operating joints. Also can be used as a horizontal work platform. Material used : Aluminium Alloy. Size - 360 Cm. (When fully opened), Self supported "A" Shape-169 Cm. Ht., Platform-144 Cm Long, 93 Cm Ht.,Fully Folded- 92 Cm. Weight - 15.140 Kg. Strong and stable design capable to carry load up to 150 Kgs. DIMENSIONS : Platform in "C" Shape - 144 cm Long, 93 Cm Ht., Fully Folded - 92 Cm Ht., "A" Shape- 169 Cm Ht., Wt.- 14.8 Kg.